Nov. 1, 2017 12:00 p.m.
FCSS Lacombe and the Central Alberta Vision for Non Violence Coalition officially cut the ribbon for the Lacombe Centre for Positive Relationships on Wednesday. The Centre, located at the Lacombe Memorial Centre, provides resources, information and services for anyone looking for help regarding domestic violence. 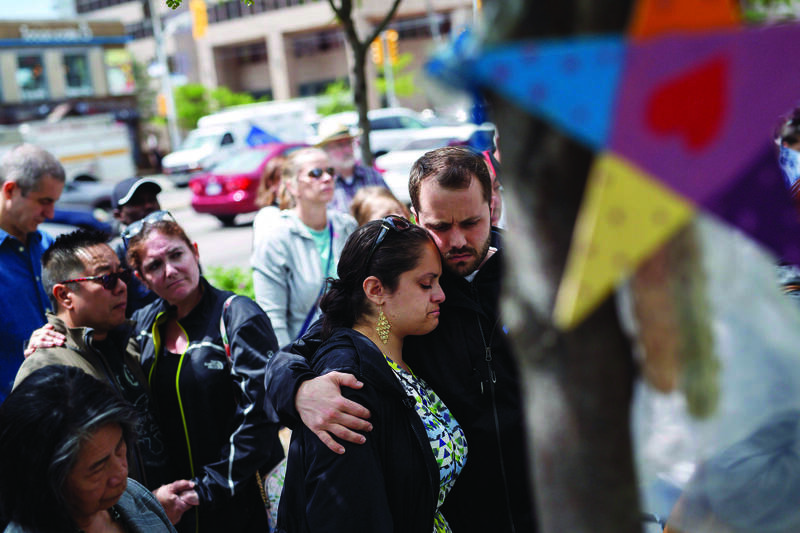 The opening of the Centre marked the beginning of Family Violence Prevention Month. This year, the theme for the provincial initiative is ‘Reach Out, Speak Out’. The public is asked to wear purple in order to show their support for Family Violence Prevention Month. “This year’s theme and tagline encourages everyone to work together to promote healthy relationships and safe communities in our province,” a press release from Lacombe FCSS stated. 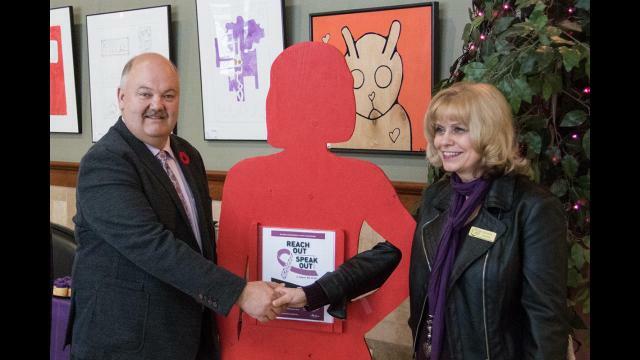 Lacombe Mayor Grant Creasey said it was pleasure for him to help promote a needed service in the community. Pyra provided details of how needed these services are in the region. “I have personally served 73 families since January 2017, which makes up 19.7 per cent of Lacombe families who have had a domestic incident occur,” she said. The new Centre will help anyone who is need of help. “We primarily address women who are leaving domestic situations, but this year but I have dealt with men who are in domestic situations or were being abused,” she said. “We have also dealt with seniors’ abuse, which is on the rise. While Lacombe doesn’t currently have emergency shelter services, Pyra said there are resources available to those in imminent danger. “If anyone is experiencing an emergency or are in an imminent threat of danger, we urge them to call the Lacombe Police and/or the Central Alberta Women’s Shelter for further support and information,” she said. “We recognize not everyone wants to leave their community, I have formed partnerships who I would prefer not to name publicly at this point. She added there are also outreach services available to rural communities, which has seen a rise is violent incidents. “It doesn’t just impact the City of Lacombe, it also impacts the community at large,” Pyra said. Lacombe FCSS is working in conjunction with the Vision for Non Violence Coalition which is organization of 13 different communities advocating against family violence offers several prevention initiatives, one of which being the Centre for Positive Relationships. Creasey added the City will continue to support FCSS to help them fulfill their mandate to help Lacombe residents in need. If you are in need of information regarding domestic violence, you can call 403-310-1818 or log onto visionfornonviolence.weebly.com. If you are in immediate danger, Lacombe FCSS requests that you contact the Lacombe Police. VIDEO: New York governor says attack suspect was radicalized in U.S.